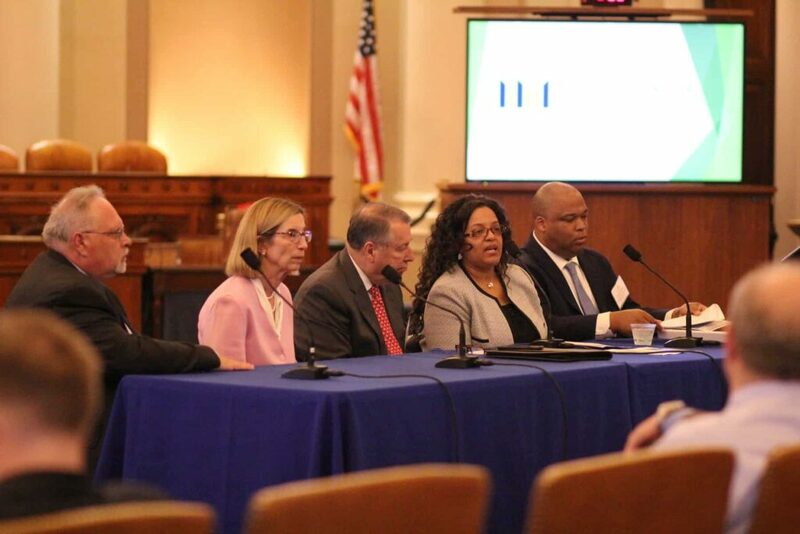 Yesterday, on April 9th, the nation’s leading community development entities met with nearly one hundred Members of Congress and their staffs to discuss the advancement of bills introduced in the House and Senate in February that make permanent and expand the New Markets Tax Credit. The fly-in, hosted by the New Markets Tax Credit Coalition, included a briefing with keynotes from the House bill’s lead sponsors, Reps. Terri Sewell (D-AL) and Tom Reed (R-NY), and remarks by Reps. Jason Smith (R-MO) and TJ Cox (D-CA). The special gathering of legislators, congressional staff and NMTC practitioners from across the country was held in the House Ways and Means Committee Room. Additional speakers at the briefing included Kermit Billups, Chair of the NMTC Coalition Board and Executive Vice President of Greenline Ventures, emcee and panelists Aisha Benson, Executive Vice President, TruFund Financial Services; Bill Dana, President and CEO, Central Bank Of Kansas City; Pat Sluder, Vice President, MassDevelopment; and Joe Summers, Vice President, Urban Action Community Development. Following the panel of NMTC practitioners, Rep. Jason Smith (R-M) also addressed the briefing attendees. (L to R) Reps. Sewell (D-Ala.), Smith (R-Mo.) and Reed (R-N.Y.) talk about their support for the New Markets Tax Credit during a recent industry coalition visit to Capitol Hill. Established in 2000, in the Community Renewal Tax Relief Act (P.L.106-554), the New Markets Tax Credit is a bipartisan effort to drive economic growth in low-income urban neighborhoods and rural communities. Congress extended the NMTC for five years as part of The PATH Act. (P.L. 114- 113) in December 2015. As Congress and the Administration continue discussions around tax extender provisions post tax reform, organizations, businesses and communities that have seen the positive impact of the NMTC have increasingly urged Congress to make the credit a permanent part of the tax code. A majority of the members of the House Ways and Means Committee cosponsored NMTC extension legislation last session, and the new bill starts off with support from 20 members of the powerful tax-writing committee. U.S. Department of the Treasury data indicates that more than 72 percent of NMTC activity is in severely distressed communities with unemployment rates at least 1.5 times the national average or with poverty rates of at least 30 percent. In FY 2018 alone, the CDFI Fund, which administers the program at the Treasury, reported that the NMTC delivered nearly $4 billion in financing to 680 businesses, community facilities and economic revitalization projects. Communities put the capital to work, creating nearly 9,500 permanent jobs and almost 30,000 construction jobs in areas with high unemployment and poverty rates.